On Sept.13rd, Professor Pei Yi Ding, vice director of Tourism Confucius Institute at Griffith University in Australia, and Professor Peter Woods, vice dean of Griffith Business School, paid an exchange visit to College of Tourism, HNU, as part of the High-end Foreign Experts Project of State Administration of Foreign Experts Affairs (SAFEA), carried on by College of Tourism, HNU. Tang Cunzhong and Tang Xiuli,vice directors of the Office of International Exchange and Cooperation in HNU, held friendly talks with the two professors. 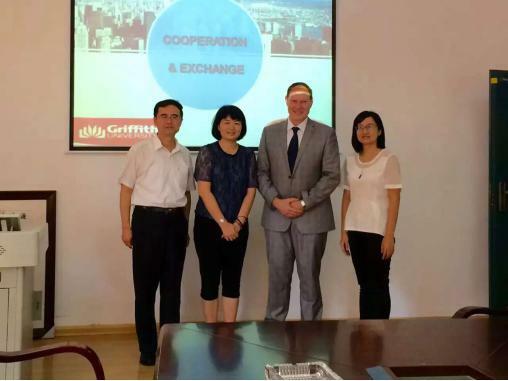 During the talk, the Office of International Exchange and Cooperation spoke highly of the achievements and influences that College of Tourism had made in the High-end Foreign Expert Program, and made a further communication and discussion on the later teaching and researching programs between College of Tourism and Griffith University. College of Tourism is expected to further enhance the international exchange program and introduce the best teachers to broaden students’ horizon and promote teachers’ international scientific collaboration. Professor Ding Peiyi: vice-dean of Confucius Institute at GU and a researcher of Tourism Academy. He specializes in tourism geography planning and tourism education. Professor Peter Woods: vice dean of Griffith Business School and a member of International Business and Continental Affairs Research Center. His major research fields are cross cultural management, human resource management, leadership, intercultural communication teaching, etc. The courses that he teaches at present are cross cultural management, management,management strategy and decision making, principles of human resource management, etc. He has written 9 books, published over 10 journal articles and several conference papers, participated in multiple international seminars, and taken charge of several projects. He has successively won the Best Researcher of Griffith Higher Education Institute, China Management Fund Awards, the Best Teacher of GU, Outstanding Contribution Award for Teaching issued by Australian Council for Educational Research, Innovation Award of GU, Brisbane Best Scholar, Best Scholar of the Year in Australia, etc.